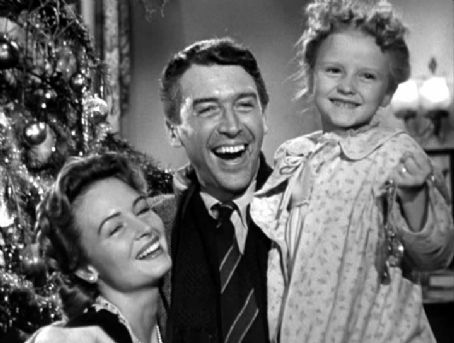 In 1946 Frank Kapra made what is arguably the best Christmas film of all time, it’s a Wonderful Life. It tells the story of George Bailey (Jimmy Stewart) who on Christmas Eve gets drunk after being told that there is a warrant out for his arrest for bank fraud. In a moment of despair he threatens to throw himself into an icy cold river, believing that this will solve all his problems. He is interrupted by Clarence, his guardian angel (second class) who appears and jumps into the water before him. George is forced to rescue Clarence but does not believe that he is his guardian angel and wishes that he had never been born. And so the scene is set for Clarence to show George that the world would be a very different place had he not been born. Had he not saved his brother from drowning, stopped Mr Gower (the local pharmacist) giving out a lethal prescription and put his dream of travelling the world on hold to run the local bank (Savings and loan). George was a man with ambition and drive, he constantly put others before himself, in every way a good man. But as can often happen he found himself in situations that he had not expected, arguably did not deserve, that at the time seemed impossible to solve. So perhaps you didn’t get the exam results you wanted or didn’t get a place at university but this is only a moment in time. It is not the end of the journey; it’s just a different beginning. So wherever you are in your lifelong learning class, have a very Merry Christmas. When faced with the bank collapsing George Bailey put in his own money to save it. A modern day lesson for some of today’s greedy bankers perhaps. Sir Fred Goodwin, please note…. This entry was posted in Confidence, Dealing with failure, Education, learning, Motivation, Success and tagged Education, Failure, learning, Motivation. Bookmark the permalink.